Seton's Custom Design Labels are backed by our 100% Satisfaction Guarantee! Select from a wide variety of Custom Design Labels at competitive prices. Plus most of our top-quality Custom Design Labels are in stock and ready to ship today. Customize a message that stays put, even in rugged environments, with our permanent, heavy-duty labels. 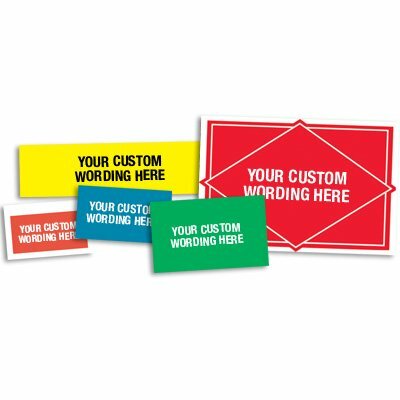 Create custom messaging that stays visible in rugged conditions with our heavy-duty glow labels. Create custom messaging that stays put in tough environments with our heavy-duty self-cling labels with back adhesive. Create custom messaging that stays put in rugged environments with our clear, heavy-duty labels. Create custom designs that stay visible in tough environments with our heavy-duty reflective labels. Flexible vinyl label features 3 types of adhesive backing for a wide range of applications. Create custom messaging that stays put in tough environments with our heavy-duty self-cling labels with front adhesive. Use your own design on our front-adhesive, heavy-duty labels. Create custom messaging that stays put in rugged conditions with our heavy-duty silver labels with back adhesive.